It’s not often a sturdy, homemade tandem gets wheeled on stage in the middle of a worship service. It is just as rare when sixty pastors who were once in dispute with each other could stand together on the same platform as a sign of togetherness, reconciliation, and unity. 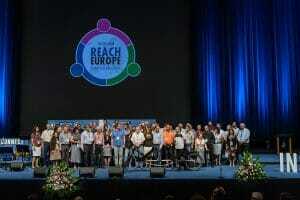 On Wednesday evening, August 29, at the 2018 European Pastors’ Council (EPC) in Belgrade, Serbia, the pastors and administrators of the Hungarian Union, many with their spouses also present, trooped onto the stage to express the beautiful spirit of solidarity that was restored to the Seventh-day Adventist Church in Hungary. Until recently, Adventists there had been divided into two groups in dispute with each other for more than 40 years. In 2015, Adventist Review reported on the historic reconciliation between the Hungarian Adventist Church and the Christian Advent Community, a breakaway group also known as KERAK. The KERAK constitution always stipulated that the movement’s members would return to the church one day, he said. The church had split in the Soviet era over differences, mainly on how closely the church could be linked to the state. Now at the EPC, Trans-European Division president Rafaat Kamal took a moment to comment on the reconciliation process and allow the Hungarian leaders to share their observations. From what they said, it soon became clear that this schism had come about while they were still children or teenagers. There was hardly a dry eye in the room as they quietly expressed their joy that the Adventist family in Hungary was united again. The tandem bicycle on stage was an apt symbol of the journey these brave Christians have begun, leaders said. It was the largest, sturdiest home-built tandem bicycle many had ever seen. Robustly engineered for touring, it was ridden 370 km (about 230 miles) from Hungary to the Belgrade event by two pastors who were once kept apart by the conflict. Now they pedal together as a fitting symbol of reconciliation. Adventist Church president Ted Wilson closed the brief celebration. “I thank God for this miracle of His unifying grace,” he said. Can’t Buy Your Way Into Harvard or Heaven?